I carry my camera with me everywhere around the farm and snap thousands of photos each year, most of which never make it up on these pages. This is a random assortment of personal favorites still sitting in my 2010 monthly 'to post' files, shown in the order they were taken throughout the year. I've separated this series into three parts because I had trouble narrowing down the list any further. 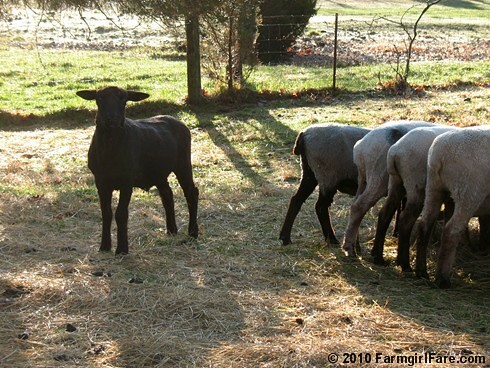 Part three will be devoted to that cute overload known as spring lambing season. Thank you all so much for your amazing kindness and support during the past year. Farewell 2010! I so enjoyed your pics! Thank you for taking the time to share them all with us. 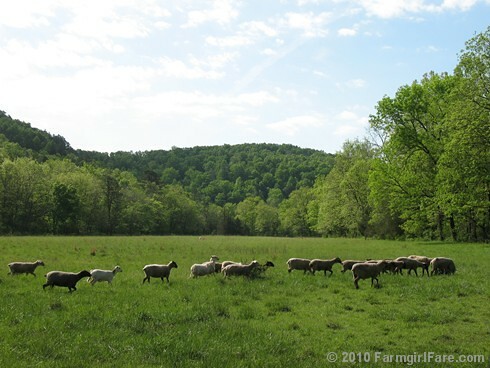 I look forward every day to reading and living the 'farmgirl' life thru your blog. Being a mid-50's widow, I don't have a 'hunky farm guy' or I would definately be out on my own farm! One day! Thanks again. Aww, I love these photos. And the one of the redbud trees along the water is just stunning. 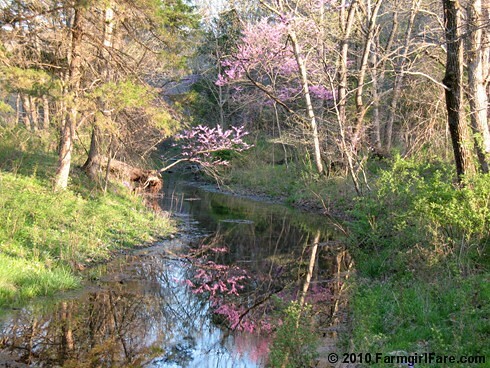 We bought a mid-Missouri farm this past year, but all our creeks are just wet-weather, and I don't recall seeing a single pinkish flower in nearly a hundred acres of woods. Thanks so much for sharing so many of your experiences in such a grace-filled way. What a delightful collection of photos!!! 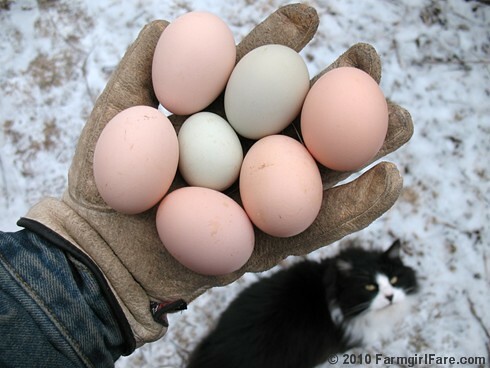 I especially like the handful of eggs... with the kitty looking longfully up. That one looks like it should be hanging in a breakfast nook! Susan, I love your blog and your beautiful pictures. And I love love love all your beautiful animals (and yes, they are people too!) May you have wonderful success and prosperity and health in this new year!! What wonderful pictures! I especially like the first one of a fluffy donkey, and the eggs. Hey Farmgirl, thanks so much for taking the time to post these-just wonderful (I supplied my own captions as I read through). I agree with Charade-the creek photo was amazing-you should submit that to a photo contest and see how you do. I also loved the one of Buddy with Crazy Daisy-and the one of him with Mr. Midnight (I think!). So great to see them interact so lovingly. 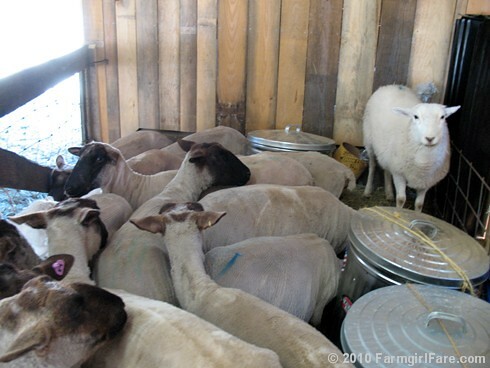 Very best wishes for 2011 to you, Mr. Farmguy and each and every one of the critters. 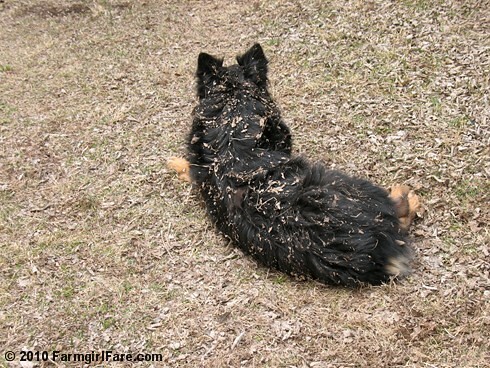 Every time I visit your blog, I usually am smiling...and today I smiled all the way through those pictures. 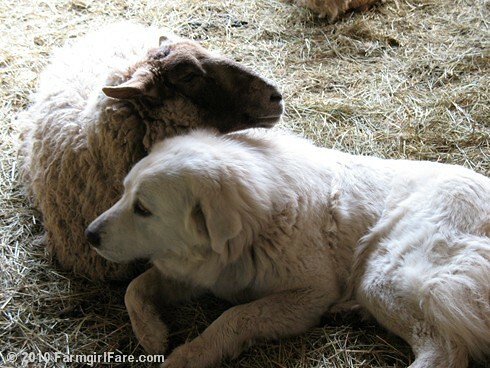 I love the one of the doggy and sheep laying there together...so sweet. I so enjoy your photos! 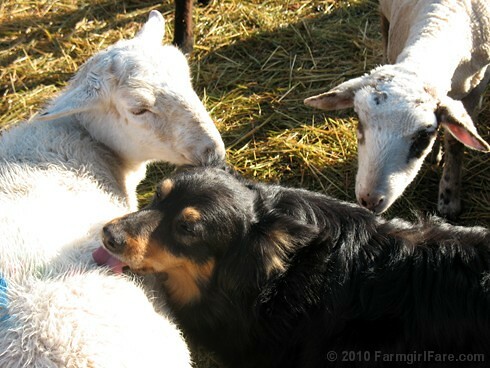 Your farm is just gorgeous and all the critters just warm my heart! Wishing you a much better 2011! Oh my gosh...what beautiful pictures...thank you so much for sharing them with us!! These are great! Thanks for sharing them with us. I wish you and everyone around you a great year full of love, cuteness and smiles - and no snakebites this year. 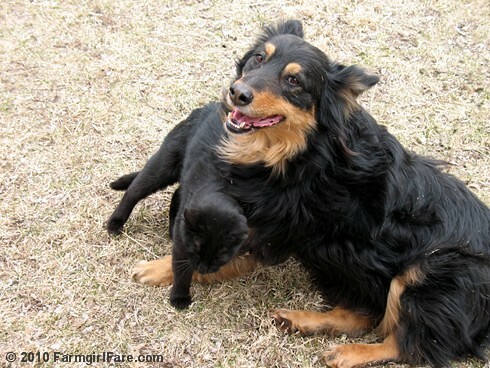 I so enjoy the pictures of your farm animals a long with the dogs and cats. 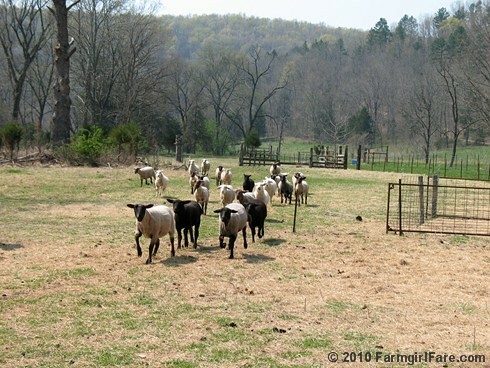 I really miss having a farm. 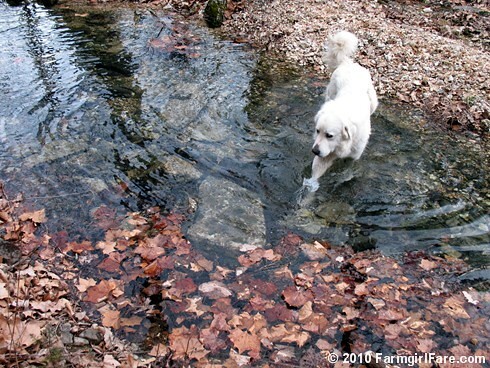 I had Donkeys, cows, pigs, goats, chickens, ducks, geese, Doves, bunnies, and Maggie Mae our great pyrenees. (Not sure I spelled that right) Anyway-Thank You so much for sharing your farm with us! 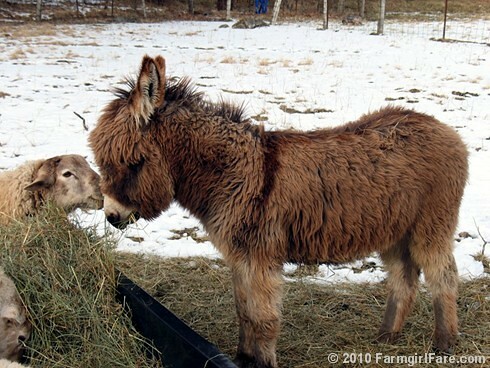 The picture of the donkey makes me want one. Always love your photos! We look forward to your daily dose of life. Happy New Year to you and yours! I visit every day---but today was special. I'm having a hard time picking my favorite. 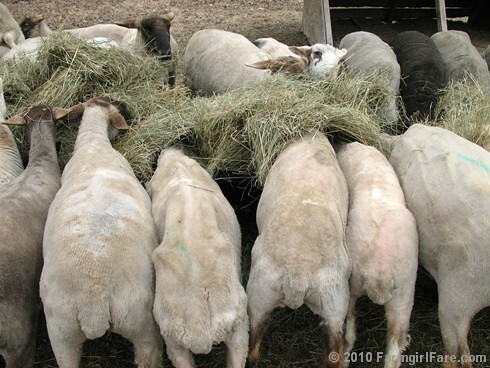 Regardless, cute lamb butts are up these at the top. Wow. These made me happy. Thanks for sharing them, they are all so beautiful. 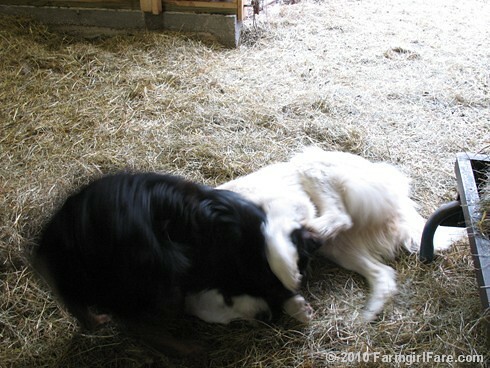 The animals always amaze me with their interactions. 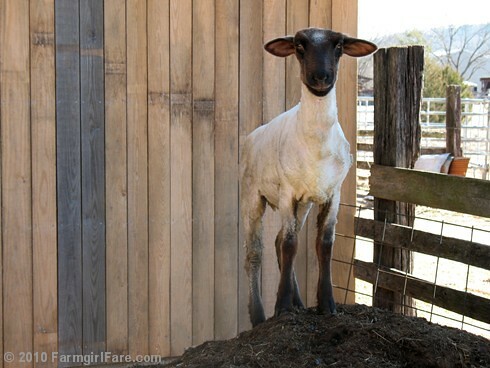 Thanks so much for sharing your buccolic farm photos with us! 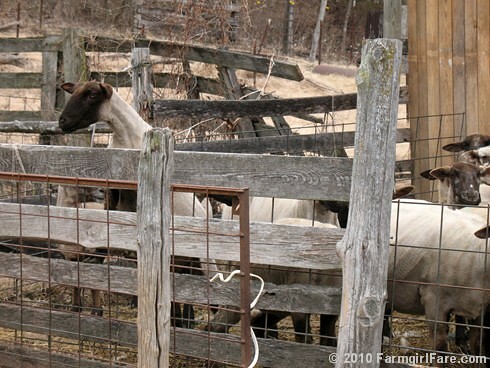 Wishing you and your hunky farm guy a great 2011! Love it, love it...even though it is hard work... BUT well work every drop of blood, sweat and tears to be surrounded by such beauty and to have all those georgeous animals as a bonus...what more could you ask for..oh and that 'hunky farm guy' too! Know that your are blessed! Great pics! 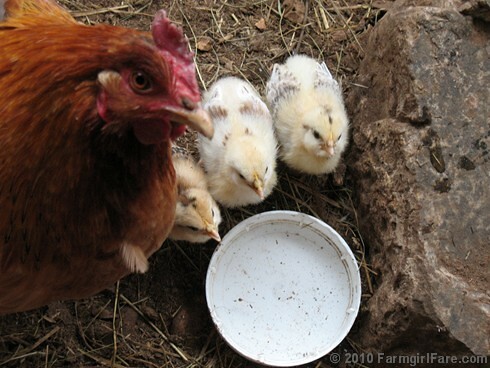 My favorite is the one w/the hen and her chicks, wow! God Bless! Nice to know that such a beautiful life can still does exist!! Our creek is just wet weather, too. It depends on the rain and snowfall, but I'd say on average it probably only runs a total of two or three weeks a year. I really wish it was year round. There's just something so peaceful about running water. And of course that cool water is amazingly refreshing in summer. We love splashing around in it (yes we skinny dip - we're miles from the nearest neighbor ;), but the days when the creek runs and the weather is hot are too few and far between. You can see lots more photos of the creek - including when it's dry, and when it's running way too much - here. I was just looking through that link of wet weather creek photos and realized that this one from January 2007 was taken from almost the same spot as the flowering version in this post, which was from April 11th. 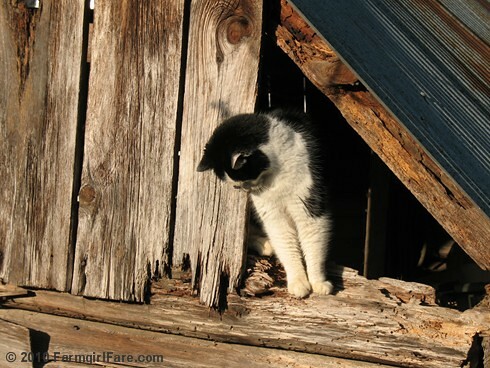 Monday Dose of Cute: Get into Trouble? Who, Me? Saturday Dose of Cute: A Spiffy New Look! Saturday Dose of Cute: Whew.